We’ve all been there. Debating between taking the plunge into the unknown or remaining comfortable on our couch. I mean, who can blame you? With the horror genres trend with diving, it seems more likely that you’ll run into the lock ness monster than see a coral reef. But, to be honest, all this is a facade. Why? Because it sells, but you know what should sell? 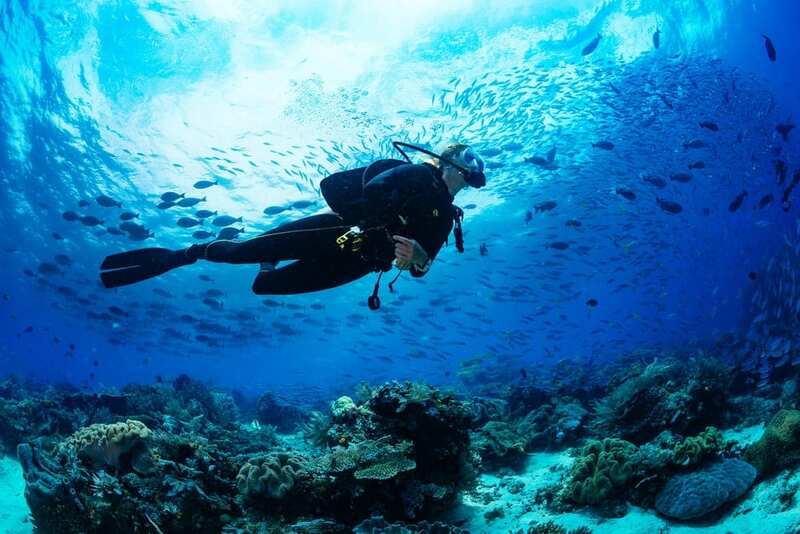 The beauty and enchantment of scuba diving. I’m sure there’s a battle in your head trying to weigh the pro’s and con’s. However, most the cons that are weighing so much don’t exist. So, here’s some insight into what is real and what is fiction in the realm of diving. Sharks are monstrous creatures that will attack you on the first site, some say they’re bigger than whales, and have a favorite meal of a human calf…right? Ok. Reality check. So, please, before you tell yourself “with my luck, it will happen,” realize walking in the rain is far more lethal. Swimming is the act of keeping ourselves above the water. As scuba diving is done under the water than technically we don’t need to know how to swim. Scuba diving is done in a state that we call neutrally buoyant which means we neither float or sink. For the sole reason of getting back to the boat at the end of the dive or avoiding objects that are hazardous. You never breast or over hand stroke at any time, your arms are kept at your side. Your kick is slow and steady. Diving is very relaxed and you should never be out of breath. The main takeaway is this. You should be confident in your ability to swim back to the boat without getting tired. Good physical condition is a prerequisite for ocean diving, especially if currents are involved. There is no chance that you get left behind on our watch. From maintaining a diligent headcount, to making sure you have a dive buddy, to having our instructors with you at all times. Being left in the water is a Hollywood story that is best left for the big screen. When you venture out on your own, you must be responsible for listening to the Divemaster’s instructions and stay with the group. This is even more important on more advanced and deeper dives, such as the drift. In this case we advise you to take the Advanced Open Water Class. Nope; we have you covered! We offer all the needed supplies when you dive with us, so you don’t have to deal with the headache that is buying your equipment. But, if that interests you look at our blog about dive gear! You will see things you wouldn’t imagine; you will feel the most confident you’ve ever felt, you will make memories that last a lifetime. This is not comparable to anything else, and we guarantee it will change you as a person. So, what are you waiting for? If you’re ready to take the plunge, check out our article about 15 tips before your first dive!